Watching this wannabe cult item from the 70s is a bit like going to a friend's party and having to deal with that one guy who has to be the life of it, but really isn't. Directed by first time auteur John DeBello, 'Attack of the Killer Tomatoes' is one of those things where the idea of it probably caused it's makers to laugh pretty hard, but simply doesn't translate beyond that. Endless scenes of tomatoes rolling on their sides (?) after their victims just aren't that amusing. Much of the humor is of the overly forced and self conscious variety. Even the title song doesn't quite succeed. This kind of thing would likely have worked much better if played straight, as if it were a serious effort made by a bunch of half wits (see 'The Lost Skeleton of Cadavara' for a genuinely funny example of how to do a '50s sci fi spoof correctly). Instead, we have a film that consciously set out to be comedic and as could be expected, most of the jokes fall flat, sometimes embarassingly so. This isn't to say that the film is a total failure. I did find myself at least smiling through parts of it. Some bits do work and the sound effects of the tomatoes always got me. There IS one genuinely hilarious sequence involving a meeting of the minds among the country's top leaders. They gather in a room so small that they can barely fit into it. There is an Asian scientist who's dubbed in an inappriopriate monatone voice. The whole scene is a riot and appears to be the only one in the film that had any real thought put into it. There were several sequels, all directed by DeBello (who seems to have made a career almost exclusively out of the rampaging red vegetables). I never bothered catching any of them. 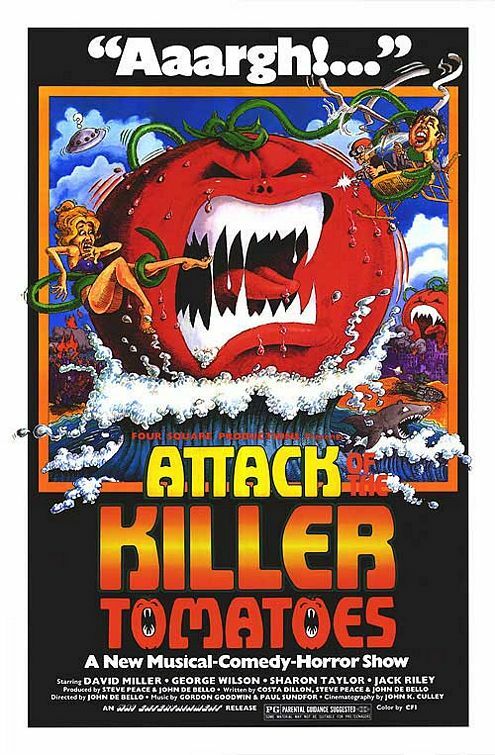 It's really a shame that 'Attack of the Killer Tomatoes' wasn't executed with more flair. Under the right supervision, it could well have become the intentionally bad movie classic that it so desperatly wanted to be. The Zuckers I think, would have likely handled this material with a lot more panache. At the very least, it would have made for a fun faux trailer in 'The Kentucky Fried Movie'.